Wow. Very few changes this time around. I don’t know if that’s a bug, therefore I just post it here. Is it intended that all the standard sliders have a blue highlight that is different from the one in the current app store versions? Also I see different highlights within Publisher itself. So … hmm … that must be a bug. Feel free to move my post to a different forum. Hi, I'd suggest the inconsistencies are fallout from the Mojave update and new 'modes'. People are working on it. 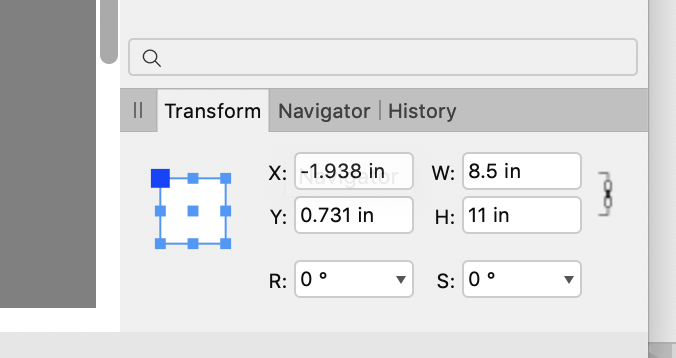 Probably a minor bug left over from the 133 build: the Rotate anticlockwise in plane button once again appeared in the main toolbar after installing this 192 build. I am not sure about this but I think it replaced the multi-function "Alignment" button in my slightly customized toolbar. Easily fixed by dragging the 'in plane' button off the toolbar & replacing it with the Alignment one. When Publisher is fully released and available, how will the upgrade be handled for all of the now Beta users. I'm concerned that if I install the Beta software now I may have conflict when going to the Apple Store for product. Please explain the process. Thanks. Preflight?  – Can any preflight be triggered by the user, too? Can I install two different beta versions - or do they conflict with each other / override shared data? Because I suspect this message only appears because of the app-update when opening an existing document I post it at this topic. I have never called or knowingly used a file called "Image Mask 1.jpg". EDIT: Solved – Please excuse these quick posting. It is not related to the app-update. The missing image was a placed screenshot I meanwhile discovered in Recource Manager. We do a few simple checks before print or export - checking for overflowing text, and that TOC and Index are up to date. It's not really a 'feature' yet. If you copy the folder before you run the new install you can have both versions side by side and run either one OR the other (not concurrent). They share application data but tend to be backward compatible except when it comes to things like new toolbar buttons. The Public beta is not the same install as the purchase version (whether bought direct from us or from the Mac App Store). Consequently there is no conflict because there is no shared data between them (you could export any customised settings (keyboard shortcuts etc) from the beta across to import into the purchased one if you wish). You files created in the betas should all load into the released version, unless we specifically announce during the beta that we have found a problem with a feature that stops this being possible (we are trying hard to avoid that situation). The Public beta will stop working shortly after launch and can be uninstalled without affecting the purchased version. 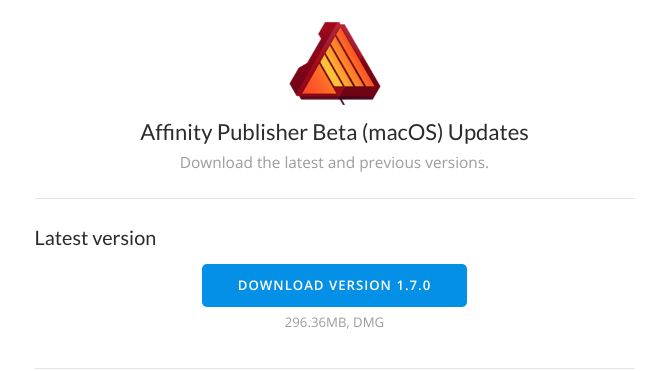 Hello @AdamW thank you so much for this update but ... the Affinity Store link is often failing when i download from that place when the other links you sent (Amazon S3 i think !!!) worked a charm and never failed a download. At the moment i'm writing this, my first download failed at 25% and i had to restart again. Please consider to check and fix the download sources as i suspect few guys here also failed from that link or from the software itself, look like the link drops or something similar. Please fix for better tomorrow. EDIT: Check the two capture i took from my laptop, the displayed sizes are different. The store show a different size than what the download manager display. I've checked the store download. It looks fine from here, and should be superior to S3. Looks like the file size on the download webpage is wrong but I think is just static content and hasn't been updated recently. Apologies for any confusion. Hope your download works out OK in the end. Well finally managed to get it loaded and installed on Mac without any issue. Load fast, no bug on load, also load my previous projects no problem ... Still i need to check if something is missing etc. Also Thanks for the Help manual it's more faster loading but still certain descriptions need to be developed or enlarged they just tell what the tool or the function is but nothing else. We are lacking of serious affinity content for learning so making a detailed help is okay ! 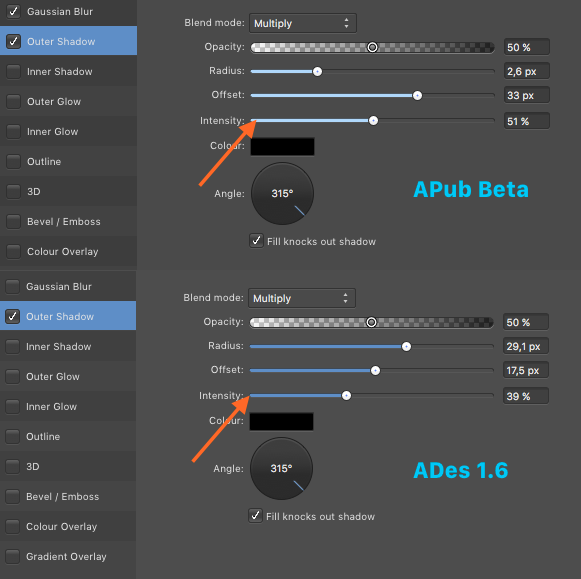 While that is up for discussion: Just to clear a few basic details about display settings ( OpenGL vs Metal) : If Metal is available in the Affinity settings, then it is automatically supported by the OS and the hardware, or do I need to figure out that myself before using it? There are also software and OpenGL (basic) as options. What are the general recommendations on how to choose one option over the others? I think there is a bug when creating a text frame by drawing a shape with the pen tool, then converting to a text frame. There is a visible line around the polygon text box and can't seem to get rid of it. I first thought that I had a stroke on the text box itself, but there is no stroke. This doesn't happen when I create a normal text frame box. I do not see that (on Windows). It would help to have your .afpub file. Any problems actually using this version please make a new topic in this forum and we'll get back to you as soon as we can. Placing PDFs is broken again in this release. They are inserted small. This was happening two versions ago, then it was fixed, now it's broken again. My temporary fix is to resize them to 8.5" W in the transform studio. Remember to set the H and W to be linked so they scale together. Placing PDFs is broken again in this release. Then, as @walt.farrell mentioned in the post just above yours, you should be creating a new topic to discuss that. Just to mention the obvious, is the clock on your computer set to the correct date? oh! Oh I was using Japanese calendar, after switching to Gregorian the problem is fixed. Thank you so much !